This learning object was brought to my attention by Julia Guichard, faculty at Miami’s Theater department. The second of two activities, the Voice Recipe is designed to help students be more conscious of vocal qualities and health. Students listen to samples of different parameters of the voice, then apply their knowledge in an activity. 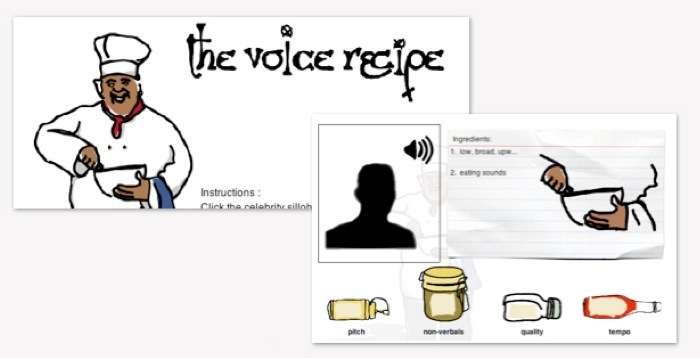 The activity requires each student to listen to a ‘mystery’ celebrity’s voice in character, then determine from a random list of voice qualities, which parameters are used. The students drag the ingredients- parameters to a recipe card. Incorrect choices snap back to the original position. Correct choices remain in the recipe. The activity was designed to be completely random. In total there are 10 celebrity voices, nine vocal qualities, and each quality has at least 4 parameters. This was designed purposefully. Students are recommended to play this activity several times to achieve a mastery of the practice. The randomness gives the student a different challenge and experience with each visit. Upon peer review, some improvements in interface/usability were suggested and will be implemented as time permits. This entry was posted in Game, Interactive, learning activity and tagged fine arts, flash, recipe, theater, voice by Britt Carr. Bookmark the permalink.